Uphill from the Mississippi River and under two miles from the outstanding Vicksburg National Military Park, the Baer House Inn boasts the perfect location to check out both — as well as everything else in the quiet city of Vicksburg, Mississippi, that’s dripping with history. 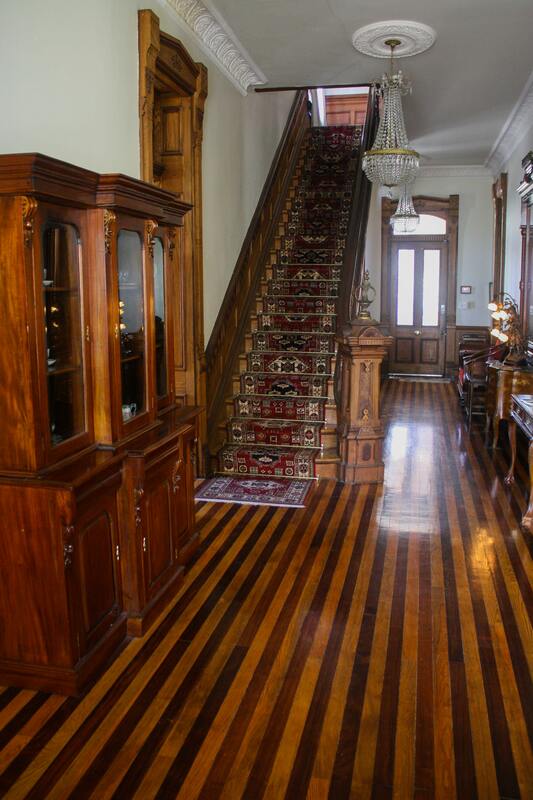 Glossy wood and a fine staircase welcome you to the Baer House Inn. As I arrived at the bed and breakfast, I could tell that it, too, was steeped in engrossing lore of the past. Listed on the National Register of Historic Places in 1980, the two-story brick B&B features four chimneys that poke out of the gray fish-scale shingles on the roof, and porches on both levels that conjure up romanticized images of Southern gentility. On my first evening here, over a glass of wine during the B&B’s nightly social hour, I met the owner, Doug Cousineau, who regaled me with the compelling story of the Baer House. Lazarus Baer, a Jewish immigrant from Germany whose dry goods business earned him quite a bit of prosperity, and his wife, Leona, built the house in 1870 and raised one son and four daughters there. Leona was a high-society lady, and she often entertained the city’s upper echelon in her elegant home that included 11 chimneys and a carriage house. She was also a strong-willed mother and arranged marriages for her girls. According to her plan, the eldest three married the wealthy Jewish men she had chosen as desirable husbands, but the youngest, Sarah, wanted no part of her mother’s social machinations. When she was 13, she met and fell in love with a friend of her parents, Nathan, an older, well-to-do Jewish man who lived two blocks away. Leona disapproved of the relationship, not only because of the age difference, but because Nathan was not the man she had selected. When Sarah was 14, she told Leona she was going to marry Nathan, and the following year she announced her engagement. Leona promptly went to the local rabbi and secretly forbade him from marrying her daughter and future unsatisfactory son-in-law. So, after the rabbi rejected Sarah and Nathan, the couple went downriver to Natchez to be wed. On that same day, Leona held a funeral for Sarah and had her symbolically buried — not in the family plot, but in the area where poor victims of yellow fever were laid to rest. Cozy up with one of hundreds of books in the well-stocked library. When the newly married Sarah returned, Leona cut her out of the family altogether, despite the proximity of the two residences. She also cut her independent daughter out of the will: The entire Baer estate would go to Lazarus and Leona’s four children. Circumventing any crafty lawyer who might contest it with the fact that there was a fifth child, the end of the will contained the sentence, “Sarah will receive five dollars.” Eventually, the unmarried son died; the three married daughters moved to New York, Ohio, and Jackson, Mississippi; and, in 1897, Leona passed away. Lazarus, now alone in his grand home, would sit on his porch to observe the comings and goings of his neighbors, including a nanny and two children who passed by his home daily. One day, he started to talk to them and, to his astonishment, discovered they were his grandchildren — Sarah’s kids. He reconnected with Sarah, realized she wasn’t the horrible person Leona had made her out to be, and put her back in the will. After Lazarus died in 1924, the eldest married daughters, who had no interest in the Vicksburg property, told Sarah to do what she wanted with it. Now in control of everything Leona cherished, Sarah, in what could be motivated only by spite, approached the Williams family, a poor but very generous family with seven children living in town in a one-bedroom home — exactly the type Leona would never have let enter her house. Sarah asked if they would like to live in the big home on the hill. Of course, they said they would love that, but they could never afford to do so. So Sarah told them to move in and give her whatever they could. For $40, the Williams family took over the Baer House and all its possessions. Sarah must have reveled in how many times Leona rolled over in her grave. The kind-hearted Williams family began giving away Leona’s possessions to people who truly needed them and then started taking in poor people who had nowhere else to go and would have been homeless without their benevolence. Over time, the Baers and the Williams died out, the house became a true boarding house (more eternal restlessness for Leona), and, finally, it was resurrected as this B&B. 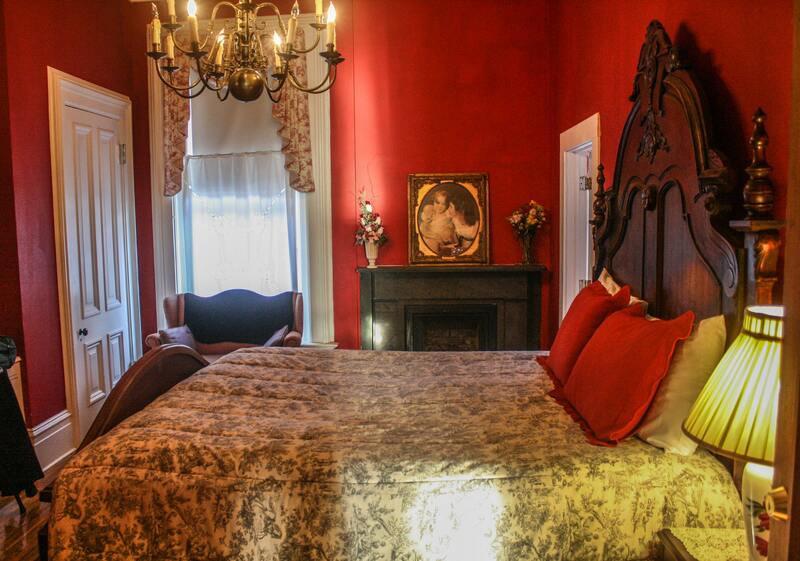 Comfortable and romantic rooms transport you back to the 1800s. With a story like that, I knew I had chosen the ideal place to stay here in the Magnolia State. But its past isn’t its only asset. Doug has done a fine job of making the Baer House comfortable for today’s visitors. Polished handcrafted American chestnut and black walnut woodwork, including the fine staircase, shine throughout the inn. Detailed plaster crown moldings and ceiling medallions for crystal chandeliers lend an air of elegance. 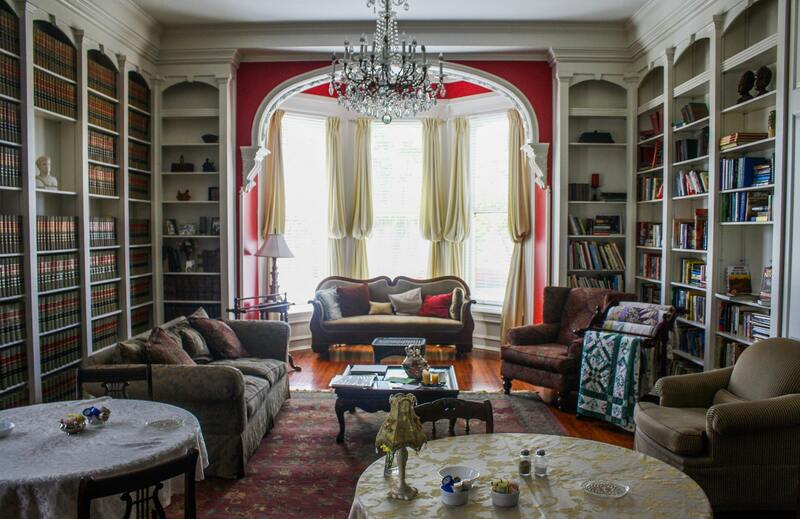 Public rooms on the ground floor include a billiard room and a large parlor with a gracious bay window and plenty of well-stocked built-in bookshelves. Seven guest bedrooms assure travelers of a wonderful night’s sleep, including my very comfortable room with its fireplace, chandelier, antique loveseat, and high king-size bed with a Victorian headboard. Breakfast, served in the old ballroom, can range from crème brûlée French toast to ham quiche alongside fresh fruit and warm biscuits. And your fellow guests can range from a Civil War buff traveling without his wife, who had zero interest in that particular conflict, to a government official working in the Foreign Affairs Office, responsible for removing land mines around the world, including in Croatia, Sudan, and Vietnam. Fortified with a delicious breakfast and good conversation every day, I was always ready to explore the city that Abraham Lincoln described as “the key” to the Union’s victory in the War Between the States.